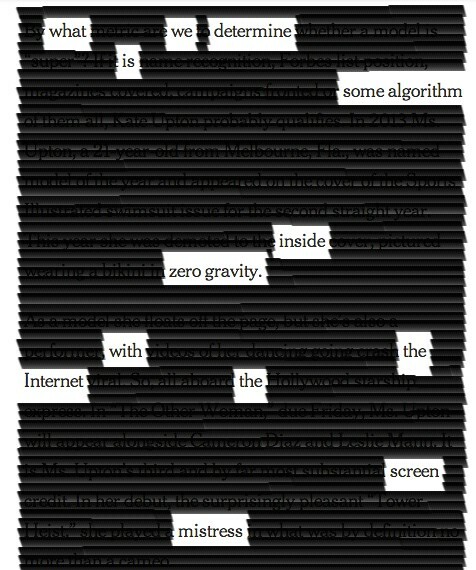 Thanks to Larry Ferlazzo, who guided me to the New York Times poetry interactive that allows you to create “blackout poems” from news articles right at the site, and then allows you to save and share them, too. I love this idea of “found ” poems, and am thinking of how to get my students into the mix later this week, perhaps. From a reading perspective, it’s interesting how you need to read the article, and then read the individual words, searching for phrases and ideas that might stem from what is available to use. Plus, there is a sequencing of words that you have to abide by, which makes the process even trickier. And yet, it works nicely. I wrote a few yesterday, including one I called Screen Mistress Algorithm and another called Unscathed. And in the spirit of the times, you can remix the same articles yourself and make your own poems, either riffing off mine or going off in your own direction. Give it a try. This entry was posted in Poetry, Technology Resources. Bookmark the permalink. Ha! I just watched a workshop on this strategy on Saturday at the HVWP and bought the book for myself and for a friend’s birthday. Same wavelength and I’m really enjoying It’s Complicated, which got a great review yesterday in the NY Times Book Review. Love to hear from you! Glad our connections continue in so many different arenas. Just you but glad to have you here. Thanks for stopping by and taking time to comment.